Shirdi Sai Baba Devotee Sandhiya Kumar from India says : Hi all, I am an ardent Sai devotee for more than 10 years. Sai has always saved, guided, protected me in different phases of my life. I would like to share my recent experience wherein Sai saved me from cesarean delivery. My complete pregnancy period has been one of my Sai miracles. I kept praying and chanting Sai Satcharitra throughout this phase. My due date was March 10, 2018. When I went for a general check-up on March 6, my gynaecologist panicked seeing high heart beat of my little one. She immediately suggested C-section and started all preparation. I was completely devastated and started praying to Sai. Later on my senior gynaecologist asked her to wait for another half hour and then check before starting the procedure. So she asked me to relax for a while. I kept up my prayers, had my Sai Baba's photo, ate Sai Udi. Shirdi Sai Baba Devotee Srinandhini Shivakumar from India says : Om Sairam! I’m blessed to share this leela of Sai which reconfirmed the power of our Satcharitra Parayan.I am using a phone that is 4 years old with very less memory (8 GB), which is no longer in production and for which, all software updates have also been stopped. I knew I needed to get a new phone sooner or later but kept postponing as it wasn’t urgent. On Saturday, 2nd June 2018, its battery gradually drained off and I put it on charging as usual, expecting it to get switched on as soon as sufficient charge had got in. However, as time passed it refused to switch on despite being on charging for hours and trying all means. I started panicking as I had to report in my 365 Parayan group and Vishnu Sahasranamam group that day. Also, we didn’t have any spare phone at home and I needed a phone everyday to report in various groups. 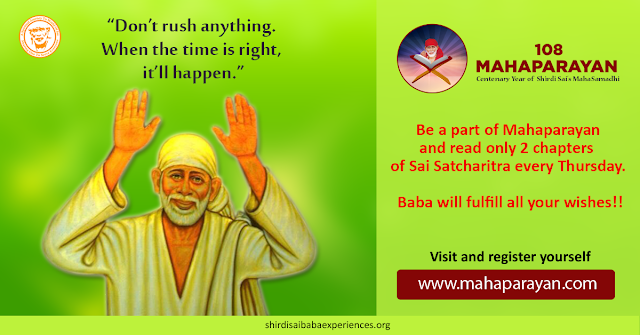 Shirdi Sai Baba Devotee Swati Ghosh from India says : Sai Ram Mahaparayan team, Please find my experience mentioned below. My name is Swati andI am part of "MPE-140 Ankita Sai" team. My humble obeisances to all of you who are toiling hard day and night to make this Mahaparayan happen. May Sai bless you always. Jayatu Jayatu Sri Sainath Maharaj! Dear Sai devotees, like you I am one of our Sai’s daughter, basking in His shower of ever-divine love and grace. I am in Ankita Sai’s Mahaparayan group MP-140 and part of VSP, SMP and Naam japa as well. Thanks in advance to you for going through this extremely lengthy post. Before I pen down my experience let me invoke Sainath’s blessings for writing this experience. It is with His grace only that we can do anything in this world, be it spiritual or temporal. Since He is the Doer, hence I rest all my incompetence at His feet. Anonymous Shirdi Sai Baba Devotee from US says : Om Sai Ram. I stay in US. 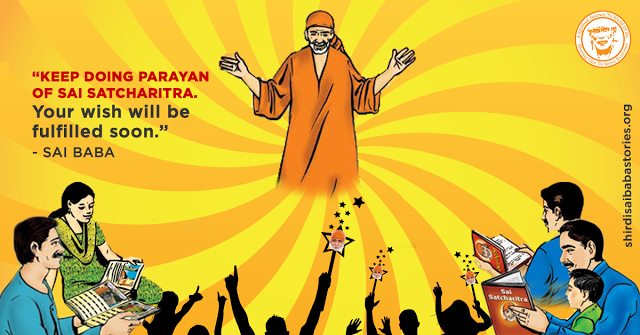 May Baba’s blessings be on all the devotees of Baba. I can’t thank enough to this wonderful team who are dedicating and serving for Baba soo selflessly and with pure devotion and commitment. I regularly read devotees’ experiences with Shri Sai Baba daily and I came to know about this Mahaparayan. I registered but couldn’t get selected. I felt upset and forgot about it and went to India for vacation. After coming up again to US one of my friends whom I introduced to experiences page got selected for naam jaap and she added me in her group, I was so happy about it and later on I was added to parayan group also. I consider it as Baba’s will and wish. After second week of parayan we came to know that my brother got his medical seat in desired college and branch, it was truly a miracle which was only possible by our beloved Baba. We had almost lost hopes on it but Baba has His own ways. Shirdi Sai Baba Devotee Gayathri Devi from Ireland says : Sairam. Om Sai Ram. I’m the devotee from Ireland, would love to share one of the leela of Baba which I recently experienced it. First of all I would like to thank all the wonderful souls behind the blog of Devotees’ experiences of Shirdi Sai Baba and Mahaparayan blog. I thank Hetal Ji and Pooja Ji from the bottom of my heart for giving me the opportunity to be the part of Mahaparayan. I regularly follow the two blogs which instills faith and patience in me. Coming to my experience, it was Friday March 30 Hanuman Jayanthi and Naam Jaap day as well for me . I was chanting and praying to Baba. Then I bowed down my head in front of Baba thinking Baba in mind and chanting Sai Sai. Suddenly I saw Jesus on Cross! Why Jesus and that too on cross? Then I finished my prayers and carried on my routine. Later in the evening when I was in the kitchen my daughter all of the sudden she told me that “ mommy today is Jesus Crucifixion day “, I was backed by surprise and bit by shock. Then I realized that it was Good Friday also! I recollected what had happened then what I understand is Baba is only Jesus. Yes Sai Ram, it was Baba only! When I was chanting Sai Sai and thinking Baba only in my mind and bowed down I saw sudden glance of Jesus! That means “ God is one “. But He is in different forms and He assumes one in whichever form we pray with faith. Shirdi Sai Baba Devotee Mayuri from USA says : Sairam. I am from MP-218 Mahaparayan group. Want to share a small leela of Baba. Yesterday night I had fever and my body was too hot so it was not allowing me to sleep. I have a habit of applying Baba's Udi along with taking medicines. But this time, I thought I will apply only Udi and will not take any fever tablet, in fact this is called faith. Shirdi Sai Devotee Riddhu Siddhu from India says: Hi Sai Family! Hope you are well, I just want to share another experience with you which shows that Baba really loves His devotees. Yesterday 21st April 2018 Saturday I walked from my home to Sai temple which is 9 kms.I walked to Baba’s temple to thank Him for always supporting and guiding me in every step of life and helping me to take out from one of the problem( I was stressed due to this from last 6 months).I also wanted to invite Baba to come and bless as I want to do a Naam Jaap at my place. I made a nice hand made card for Baba too. Anonymous Shirdi Sai Devotee from India says: Sairam all,Om Sai Ram. Baba’s daughter from India participating in MP-48, and I wish to please remain anonymous, Pooja ji. These incidents happened before two days and I definitely should share these with you all. Two nights before during small squabble I by mistake hit my husband in the jaw and he was in lot of pain. I got so scared and prayed to Baba that moment itself asking Him to please save me and that nothing should happen to him. He even had a concert the next day as he is a musician. I was so scared but it was nothing but a miracle that nothing serious happened and even the next morning, when I was afraid that he would wake up with pain, he was alright and normal. This is nothing but a miracle of our Baba. Shirdi Sai Devotee Sweta from India says: My brother-in-law recently lost his job and has been in search of new opportunities since then. Life has been a little hard on him as he lost his leg in an accident at the age of 5 and also he is hearing impaired. Thus he always had low confidence. As family we always supported him move ahead work out on his opportunities. However things never turned his way. Thus he became agitated and frustrated. He used to get angry over simple matters and create ruckus at home. 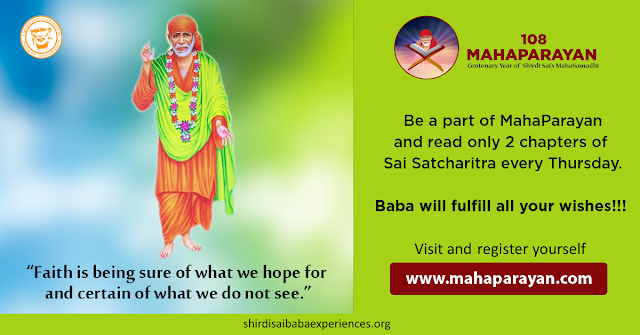 I joined Mahaparayan group with faith on Sai, that He will bring peace in our lives. I started the parayana on 30th May 2018 in MP-233- Ashwini group. My name is Sweta Rallabhandi, roll no is 09 and house is Red. This week my mother- in -law also joined the MP-235 group. Shirdi Sai Devotee Sunitha Dinesh says: Om Sai Ram, I am grateful to be part of Maha Parayan, Maha jaap, 365 Stavan Manjari groups. With Baba’s grace, I am also the captain for one of the zones in Mahajaap Group. Thank you so much for giving us all the opportunity to be part of Baba’s centenary celebrations and to offer our love and gratitude. I am experiencing endless leelas of our beloved Sadguru Baba, our Karunamayi Saima. When we started Mahajaap chanting trial round, on Thursday, Feb 8th, we received Baba’s Silver idol from my Mother- in-Law who came from India on a Wednesday, even though there was a plan to meet them on that day, met them on Thursday and we got the Silver idol of Baba with the blessing hand. Baba made me also to chant that day (trial round) in His temple that I frequently visit which is like Shirdi. This happened due to His grace, in spite of team lunch I had to attend that afternoon and made it in time, right at my slot time. Anonymous Shirdi Sai Devotee from India says: I really like to stay anonymous. Thank you for understanding and all your support. Thank you so much everyone that are involved in this great move and so thankful for the opportunity to be a part of Baba’s family. It feels so blessed and cared by Baba at every step. I was in such a disturbed stage in my family but Mahaparayan opportunity came to me like such a blessing and helps me feel the blessing and Baba’s support. Also like to mention couple of miracles that I experienced about all the other spiritual things taking place like Naam jap and Vishnu Sahasranama Parayan (VSP). When we started the Naam jap, I was chanting Baba’s name as much as possible. During that time, one day my family got locked out of the house. No one had keys to the house. We finally decided to call the locksmith. I was thinking that “why am I in this situation Baba? Can You please help Your children? I know You are very kind and love Your children “. In few seconds, I remembered that my friend might have my house key (I had given her 10 months ago) and texted her. She replied immediately and gave me the keys. It really shows how kind and loving Baba is! He takes care so immensely and I cannot express my thankfulness. Shirdi Sai Devotee Rakhi from USA says : Today I wish to share a beautiful leela. Baba and His ways are always amazing and full of meaning. I do Khichadi Parayan (Part of Brahma Muhrat Parayan) and offer khichadi to Baba in USA. It’s actually Wednesday evening for me(in USA) and when Pooja ji always said at the end of the parayan to donate Khichadi, I find it hard to do that. And last week I said Baba that only I eat your khichadi, to whom should I donate it to? Shirdi Sai Devotee Hima Bindu from India says: Om Sairam. I am Hima Bindu from Bengaluru. I experienced a shocking yet beautiful miracle yesterday. 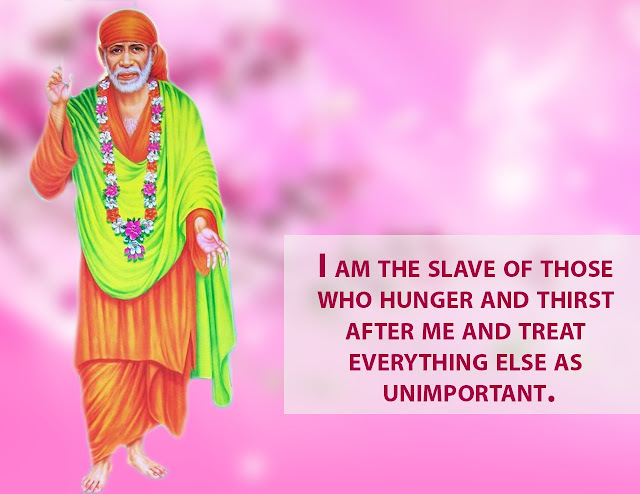 I'm a disciple of Sai since 19 years. After I started the Mahaparayan, my daughters were born. So I've named both my daughters after Him. In the span of these 19 years He has done a lot for me. Shirdi Sai Devotee Barsha from India says: Om Sai Ram to everyone. I am a small devotee of Baba. I can’t imagine a second without Baba. Since the time Baba came into my life everything has become Saimay. As said in Satcharitra one who thinks of Baba and starts worshipping Baba then his world becomes Saimay. I am very thankful to Baba that He has given an opportunity to share this experience of Mahaparayan by making me a part of MP-55. Here I want to share two recent experiences of Mahaparayan in my life. Baba has started Mahaparayan to bless all of us and fulfil all our wishes through His Satcharitra. I have experienced many a times while doing Mahaparayan all wishes were fulfilled and it makes us free from troubles. Making us more relaxed and increases faith on Baba. First experience was about my paid internship. As a MBA graduate we have to do an internship in our final semester, so that we will have some practical knowledge about the subject. So started searching and applying for various internships but was not getting a suitable one. Regarding this I prayed to Baba and took permission also by taking His live darshan. Shirdi Sai Devotee Nitii Seth from India says: Sairam all, I am Nitii Seth from New Delhi. I am from MPE-140 Mahaparayan group. I would like to share my Dream experience with you all. Today I had a Dream, where I and one lady who was quite rich, was standing with me. I guess she was from a politician's family. I had gone for some function to their Bungalow. It was getting late so she wanted her driver to drop me home. So we both were standing outside. Shirdi Sai Baba Devotee Susama from India says: Sai Ram, Om Sai Ram. I am Susama, member of red house group, roll no-9 of Mahaprayan 2018-19. My life is full of problems and full of Sai blessings too. Due to some problem I was staying ½ year in my sister’s house, then I got a job in a boarding school due to Baba’s grace. Distance between my workplace and sister’s house was more . That’s why I kept my scooty which is one of the gift of Sai in my sister’s house. 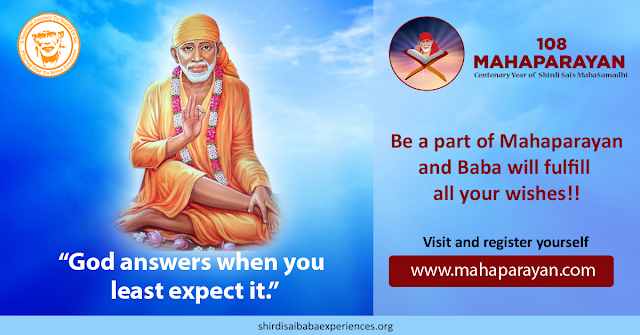 Anonymous devotee of Shirdi Sai Baba from India says: Sai Ram, Such wonderful experiences all of us have had after joining our blessed Mahaparayan. I belong to MP-48. I recently bought a new car by Baba’s grace. I wanted only Baba’s little statue on the front, just like I had in my old car. I kept a little big statue as that’s what I had at that time but it wasn’t seating properly due to the weight, so my mom changed it to a smaller statue. I took the car out to fill petrol and on seeing Baba’s statue, I told Him, “Baba now You are here, You take care of everything, I leave the safety to You hereafter, I won’t worry”. Shirdi Sai Devotee Laxmi Sonwani from India says : Om Sai Ram. Ever since I got enrolled in Mahaparayan all my problems are getting solved day by day. My mother’s health problems have improved and now she is better than before. Shirdi Sai Devotee Vyjayanthi Kamath from India says : I am Vyjayanthi kamath, Maha parayan group Roll no. 41. It so happened during the last days when I was about to leave UAE and come to India for good, all my friends were giving me farewell in one or the other way. Some were inviting me home for food , some were taking me to the restaurants etc. Amongst my friends, there was one doctor couple, they knew that we love seeing places . They took us to a lake in ALQuadra, Dubai in the morning and in the evening they planned to take us in their open sports car for a long drive. Here the miracle took place, they came to pick us with the car. The top opened, it was a pleasure to watch the car when it opens it's top. It opened and we were ready for a drive. The car was in a great speed, after about 10 to 15 mins of drive, my friend suddenly remembered she had kept her purse behind the deck of the seat. Naturally when the car opened, the purse might have fallen down and it had all valuable things, her big diamond earrings, cash, credit cards, house keys etc. They were quite upset and started arguing. To come back to our pickup point it would take not less than 30 minutess. Anyhow we thought of going back to the pick up point. Shirdi Sai devotee Prateek Tripathi from India says: Sai Ram to all, I was extremely happy to be a part of Mahaparayan. I was very excited. I woke up the first day of my Mahaparayan and read my allotted chapter. Then I went to Sai Temple. Sai was preparing a miracle for me, guess what the same day in the evening I received a post from saidhamsola.org with a very beautiful photo and Udi of Sai. I was shocked. I just applied a week ago. How did they send it so early. They themselves say that it takes a lot of time as there are lots of requests worldwide. 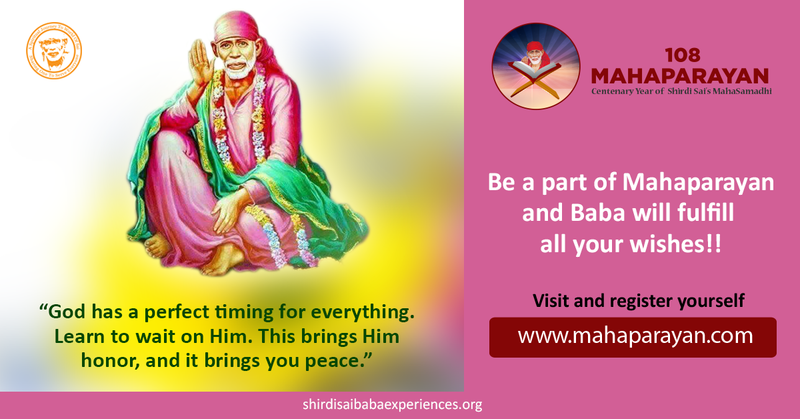 Shirdi Sai devotee Yougandar from India says: I would like to share my experience during Maha Parayanam. I'm a Baba bakht and was doing weekly parayanams on and off earlier. Last year I got a message from my Sister about Mahaparayan. Even though I was glad to know about such a good program I was skeptical to join because of previous experiences and doubts about Parayanam. 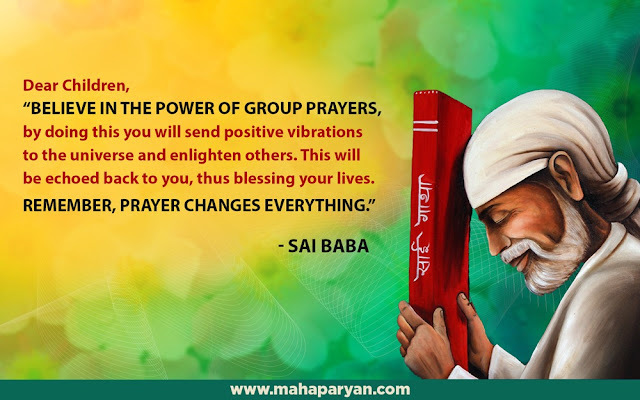 Previously I had some tough experiences while doing weekly parayanam and I thought maybe I am not suited to do Parayanam, but don’t know somehow finally joined Mahaparayan group, maybe it was Baba's wish. First few weeks went well and I was happy doing Parayanam. My wife was pregnant at this time and was praying for everything to be normal. Suddenly after Diwali my wife experienced complications and had to be hospitalised for few days. The doctor said baby was in danger and my wife needed to be in hospital until the situation was normal. It was very tough time worrying about her health and also taking care of my 2 year old daughter alone. At the same time there was a major issue in office and I had to be on calls for 8 to 10 hours daily for 5 to 6 days. It was the toughest time and I thought maybe Baba is testing me and doesn't want me to do Parayanam. 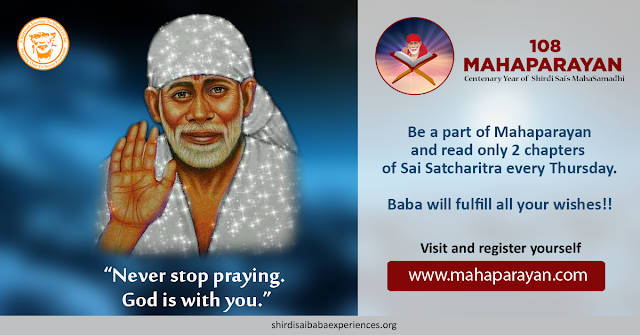 Shirdi Sai devotee Archana from India says: I am Archana a Sai devotee from Bangalore. I want to share an experience that I had on 16th of April. My daughter adopted a stray dog from a shelter on 13th of April. On 16th April the dog was alone at her house as she and her husband had gone for work. I told my driver to go to her house and take the dog for a walk. The dog got scared and ran out of the house as soon as the door was opened. The driver ran behind her and could not find her anywhere. He called up to inform me and all of us (my husband, son-in-law, daughter and I) rushed home from office. We started searching for her in the entire locality and could not find the dog. Shirdi Sai Devotee Swarna Laxmiji from India says: Om Sai Ram. 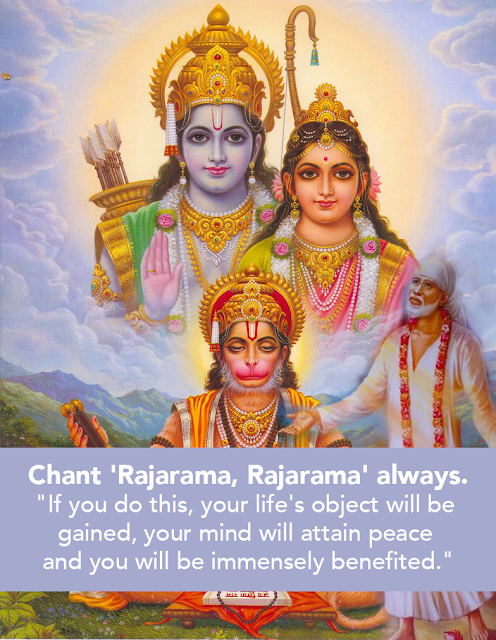 I had wanted to share my experience, though a small one, of Hanuman Chalisa and Ram Jaap chanting. I started on Sunday, May 20, at a temple where there was a statue of Hanumanji. I prayed that I will do it first least 48 times. I started and increased slowly, ranging around 6-7 per day. I was telling my sister on Friday May 25th night about the details that were novel for us, buckets of water and garlands. Then on night, Friday May 25th night, I had a dream. I am entering a temple, in a huge queue. Then I see that the sanctum sanctorum was placed quite high, up a few steps. A man was standing there, he was saying in Tamil, at home we may not be able to do the Ram Jaap. So all of you chant Lord Rama's name here in this temple. Then the entire crowd started chanting and I was also chanting along with them. Shirdi Sai Devotee Arathi Nagesh from India says: My name is Arathi Nagesh and I recently relocated to Bangalore from Singapore. I have been a Baba devoted for more than 15 years now and He has always helped me sail through the tough times and has blessed me abundantly in my life! I owe a lot of gratitude to Baba . It was always my wish to distribute Prasad in a Baba’s Mandir since ages and it was not happening at all due to practical issues like the distance, me not driving a car in Singapore etc . As I relocated to Bangalore, I prayed to Baba to make my two dreams come true. One was the distribution of Prasad and second one being to find a small group and hosting a Baba bhajan session in my house every Thursday. Shirdi Sai Devotee Sneha Agarwal from India says: I am Sneha Agarwal from Pune. This is my recent experience. I am on my vacation to Bangkok. While clicking a selfie with my daughter on the swimming pool my mobile fell in the pool by my daughter. I immediately removed, wiped and cleaned it. I tried calling from that phone but the volume and the back button had stopped working. Slowly the whole mobile got shutdown. There were no chances to repair it over here so I had wrapped it in a cloth after using a hair dryer on it and kept it in my bag. I tried to Switch On again but it did not work properly. Then today suddenly while climbing the escalator for our dinner cruise a packet of Udi fell from our sack bag. My husband immediately picked it up and kept it in the bag. At that very moment I felt as if Sai Baba was indicating and reminding me of something. On our way back to our hotel at about 10 o’clock now I prayed to Baba that "I will apply Udi on my mobile after going to the hotel room and my mobile should start working and I will post my experience in Sai Darbar group immediately. I did the same on returning. And lo, what a miracle! Soon after switching On the phone, it started working well like before. I shouted loudly upon this as this was a miracle for me because it was impossible for it to start after falling into the pool. Shirdi Sai Baba Devotee from India says : Sai Ram, I Just wanted to share a Leela which I had experienced on 21st march 2018, and I am so so so happy. I can only say that Baba really listens to all of us. I am participating in Vishnu Sahasranam which is starting from this Ramnavmi, actually I enrolled myself in Thursday group but then I was thinking to change my day because I am already busy with too many things on Thursday as I have to do Parayan recite Sai Sai Sai 5100 times and also do Kasht Nivaran mantra plus I am also working on Thursdays. So thought I would change my day from thursday to Friday, but when I asked Baba that I will open Sai Satcharitra in the evening and if the same chapter in which Baba told Shama to read Vishnu Sahasranama will come I will feel that You have accepted the change but actually I forgot to open Shri Sai Satcharitra during my evening pooja and now when I was about to sleep I checked facebook and Sai temple Sydney had uploaded some pictures of Baba and also uploaded this page from The Holy book(See the picture).